The 13th Annual Asia Derivatives Conference (Asia 2017) took place this 28-30 November at The St. Regis Singapore. 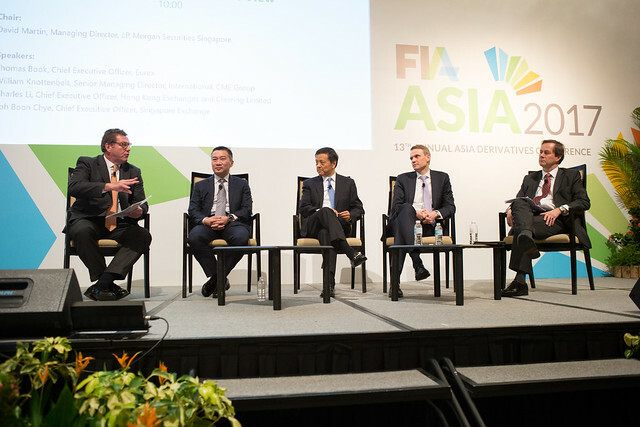 Asia 2017 brought together key actors in the Asia-Pacific cleared derivatives markets to discuss operational challenges, explore opportunities for growth and analyse important trends and topics affecting the industry. The programme featured topics on the impact of MiFID II on the Asia-Pacific markets, cryptocurrencies and Chinese derivatives markets. Trusted market participants, technology vendors, regulators and exchange leaders had numerous networking opportunities and met with more than 30 exhibitors featuring the latest products, services and solutions serving the Asia-Pacific region. In addition to regular features such as the discussion among exchange leaders, an assessment of clearinghouse issues, regulatory developments and the now-famous Great Debate, this year’s programme will focus on emerging technologies, developing markets, operational and technical issues and more. Discover growth opportunities and innovative ways to move the industry forward. Check out the PROGRAMME to see the sessions, networking, and exhibit activities at Asia 2017. Additional programme details will be posted as they develop. The EXHIBIT HALL at Asia 2017 is already sold out! Plan your schedule at Asia 2017 to maximise your time with these vendors during networking breaks and the Taste of Asia reception on Thursday afternoon. Check out this year’s exhibitors including regional and international exchanges as well as technology solutions for trading, clearing and more. Wrap up your Asia Derivatives Conference experience by giving back. The Charity Golf Outing is set-up as an 18-hole Scramble on the Sime Course at the SINGAPORE ISLAND COUNTRY CLUB. With breakfast and lunch provided, you will have plenty of time to network with fellow attendees – and support a fantastic charity, FUTURES FOR KIDS. Founded in 2008 by a group of people in the futures industry in Europe, Futures for Kids supports children’s charities around the world through fundraising events and private donations. FIA returns to THE ST. REGIS SINGAPORE for Asia 2017. Located in Singapore's premier shopping district and steps away from the UNESCO World Heritage Site of the Singapore Botanic Gardens. Book your room today! Top executives at global exchanges and clearinghouses as well as brokerage firms came together from 6-8 December 2016 for the 12th Annual Asia Derivatives Conference. Covering topics including product development at exchanges in the region, the continuing impact of China, how local firms are dealing with operations and technology issues, and more, Asia 2016 attracted nearly 800 attendees and featured more than 30 exhibitors. Check out HIGHLIGHTS FROM 2016.